I have been busy testing everything I can test in test realm. Been crafting all the new Celestia furniture, some pieces are simply wonderful KingsIsle did a awesome job getting these pieces together. Ok back to gardening , you know me I can get carried away with talking about housing ;). I read a interesting article by Fallon Shadowblade Over at MMO Sanctuary. Good read. There are many bloggers with some really good info If you head over to The Friendly Necromancer's Blog take a peek at the bloggers club there are many bloggers talking about the gardening. Lots of great info. 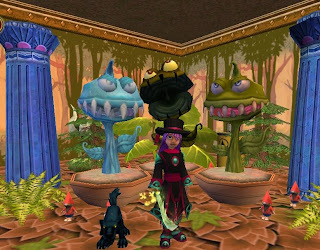 Oh and make sure to tune into Ravenwood Radio Wednesday, Dec. 15 at 8:00 pm as I'll will be talking about gardening in Wizard101. Here are a few tips and Tricks I have learned along the way. Fastest way to level- Well nothing is ever truly fast in gardening but the quickest way is to have, all of the same type of plant so they will all go elder at the same time. Each time you level get the next level of plant and do the same thing again. Dorm Room Gardening- Remember this is one room Try to make sure plants can all go together , I have done some testing and baby carrots in same area as stinkweed do not mix well, infact my baby carrots died. :( After trying with a higher level plant the plant simply is not growing well much slower than the other one I plant in another area. There is good info on each seed that tells you what it likes and dislikes. Pet training and Gardening- I have been testing with a level 20 and a level 30 wizard Both in dorms room. I found it easy to take care of 5 or 6 plants and still have enough energy to still train a few mini games. Take care of the plant first. This depends on if your plants had a pest or not. After then you will know how many mini games you can play. My level 20 was able to take care of 5 plants and do 4 to 5 mini games, if the plants had pest then around 3 mini games. This also depends on if you are using the beast master gear or not, I was not. MY level 30 was able to do more mini games with same amount of plants. Plant care - If you play wizards once a day planting is easy, and with the new ways to tell what your plant needs makes it so much better KingsIsle even gives away to see how long till your next harvest. Yes plants die if they are not taken care of at least once a day or every other day at the most. I would suggest anyone who does not have time during the week plant on a Friday then by Sunday they should be Elders depending on plant, Honey sickles seem to be fastest. Each type of plant grows at different speeds so can take a longer time to care for. Signs of Harvest - Each plant has its own tell sign of when its ready to harvest. First stage is a seedling, next a young plant( these plants do not move) ,Mature plant are animated when mature plants are ready to harvest they Move a lot. So far here are some of the tell signs I have found. To harvest make sure you are not in gardening mode and jsut walk up to the plant to get the X to harvest. I would love to see a plant harvest some energy I could really use some :D Anyway here are tell signs. Laugh-o-dil looks like they are going to fall over. Gnomes - These funny little statues I have found they help with harvest but it does not matter how many you have. I can have 1 or 5 around a plant and get the same amount of harvest. I have found they do not help with growth speed in testing 2 kinds of plants both with and without gnomes both grew at same speed. I do hope we get more of a variety of these little statues as I am getting tired of the red. Gardening and Decorating - I have a couple of tips, One being If you use the pick up all items It will leave soil and pots that have plants in them, it will pick up all pots that do not have plants. It will also leave soil that do not have plants. Next tip is location , remember some plant have likes and dislikes so locations of plants are a must to think about. I do hope KingsIsle makes it so you can move pots(only) with plants as of right now if you do the plant stays. Also Your inside and outside of your house are 2 different gardens, if you use a all plant spell it will not effect both inside and out. As of right now I am rank 7 in gardening and still learning more each day, my hopes are that these tips help the future gardeners of the spiral and until next time ,happy house decorating. This was kinda useful. Not exactly what I was looking for but it is good still.